Ahmad Baksh Gama was born in Datiya (MP). He was fond of wrestling since his childhood. By 20, he had defeated all most all the national level wrestlers. "Rustam-e-Hind" Gama pehalwan, who brought the Indian style of wrestling to international sports and lend it credentials, had tricks of the trade running in his blood. In 1910, a wrestling match was organized for the award of the title "Rustam-e-Hind", Gama defeated all the wrestlers and earned the title. Gama's last match was with J.C Peterson whom he defeated in 45 seconds. Gama wrestled for many years and always emerged victorious. One of his greatest quality was that he had not only a sense of self respect but was very friendly in nature. 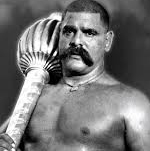 Indian wrestling owes its popularity to Gama. He died in Lahore on 22nd May in 1960.